to sing and steam to come ont of the spout ne heard a sound like a soft, muffled step, patter, patter, patter overhead, and the next moment the fox's head and fore paws were seen coming down the chimney. 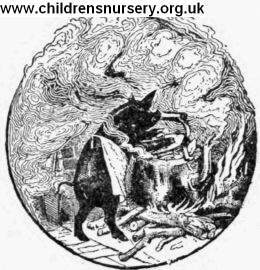 But Blacky very wisely had not put the lid on the kettle, and with a yelp of pain the fox fell into the boiling water, and before he could escape Blacky had popped the lid on and the fox was scalded to death. proached the den he heard piteous grunts and squeals from his poor little brother and sister, who lived in con­stant terror of the fox killing and eating them. But when they saw Blacky appear at the entrance to the den their joy knew no bounds. He quickly found a sharp stone and cut the cords by which they were tied to a stake in the ground, and then all three started off together for Blacky's house, where thev lived happily ever after; and Browny quite gave up rolling in the mud and Whity ceased to be greedy, for thev never forgot how nearly these faults had brought them to an untimely end.